It’s hard to believe that New Year’s Eve 2018 marks the 23rd anniversary of the end of Calvin and Hobbes. While two decades may sound like a long time, the strip has dated remarkably little. Instead, it is slowly but surely being recognized as the work of art that it is, and not just by the generation that grew up reading it. I watch every year as parents of young children giddily introduce the work to kids scarcely older than Calvin himself–and the kids get obsessed. Just last week, a second grader came over to our house for a playdate and essentially melted down when he spied the boxed set sitting on our shelf. 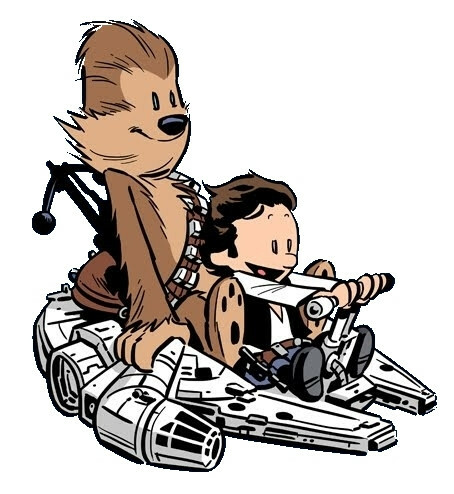 Mark my words: Calvin and Hobbes will go down as one of the abiding cultural achievements of our time. The amount of expression and joy and humanity that Bill Watterson was able to wring out of those four panels over ten short years (1985-1995) is simply astounding. There are tributes elsewhere that cover the craft and content of the strip. In fact, there’s a wonderful, wonderful series called “The Theology of Calvin and Hobbes” that Richard Beck put together a few years ago on his Experimental Theology blog that, if you haven’t read it, is very much worth your time. The series is so good, in fact, that it’s prevented me from writing about Calvin and Hobbes at any length–until now. It has become something of a Mockingbird tradition to take a few shots at the concept and practice of New Year’s resolutions every January. For people who are interested in the theological and psychological mechanics of the Law (what you should do/be), it’s just too tempting. I hope you can forgive us. If you can’t, probably best not to read any further. Of course, there’s a danger in decrying New Year’s resolutions with such regularity, and I’m not just talking about the predictability. I’m talking about when we cross the line from healthy cynicism to actual defeatism, and in some cases, genuine despair. The Christian faith may not be terribly optimistic about human potential/agency, but it is not defeatist. With God all things are possible, as the Man once said. And we would certainly not want to begrudge anyone for wanting to hit the gym or spend more time with their kids. We pounce on the phenomenon of New Year’s resolutions because it provides such a natural access point to discussions about the Law and, therefore, the Gospel. Think about it: resolutions are almost always the expression of a failure to live up to some kind of standard or ideal (physical, emotional, practical, material, etc) along with an intention to rectify the situation. Success and failure, righteousness and identity, willpower and judgment–it’s all there. Even if we’re someone who rejects the idea of universal morality out of hand, that seldom prevents us from striving, every January, for some kind of personal goodness or enoughness. The fact that our resolutions look so similar to our neighbor’s may be inconvenient but it’s merely coincidental. Or so we tell ourselves. Perhaps the self-improvement urge is such a pervasive one because we all know, on some level, that we could use a little improving. The Bible chalks this up to the Law being written on the heart (Romans 2:15), that the human relationship with righteousness is instinctive and universal, and by no means limited to churchgoers. You might even say that resolutions, at least when they’re remotely serious, are simply a “secularized” expression of a religious impulse–#seculosity, if you will. What does this have to do with Calvin and Hobbes? Well, I was leafing through my collections over the holiday and discovered something fascinating. 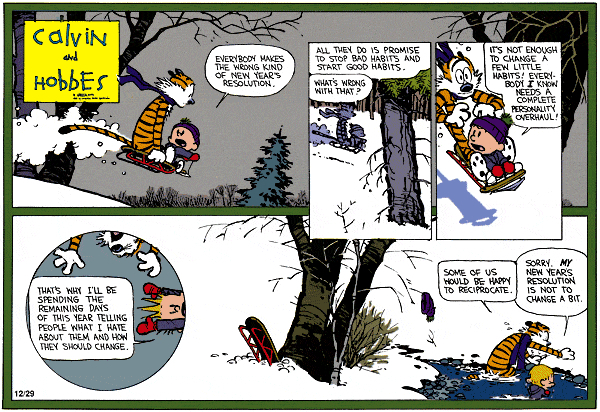 With the exception of the first two years of the strip, Watterson annually revisited the subject of New Year’s resolutions. Clearly the practice struck him as 1. funny and 2. ripe for commentary about deeper things. Moreover, in reading each of the strips, I realized that he had, perhaps inadvertently, cataloged the human response to judgment (and relationship to self-improvement) with remarkable breadth and thoroughness. In Galatians, the Apostle Paul talks about the Law being a “disciplinarian” (3:23-25). The King James translates the same word as “schoolmaster.” “Taskmaster” might be a happy medium. You might not be someone who thinks of themselves as fundamentally occupied with “the Law of God”, but the notion of an internal or external taskmaster makes a bit more sense. The voice that is always evaluating, always pointing out mistakes, always criticizing, always banging the drum of ‘not enough’—-maybe the internalized voice of a parent or teacher, maybe their actual one. Or perhaps it’s the cultural imperative to never stop growing, progressing, improving, etc. Whatever form it takes, this voice of condemnation serves as a distant or not-so-distant echo of the Law of God. It may stem from the best of intentions, but it rarely enlivens. Instead, it exhausts. This being a comic strip, Watterson has exaggerated things for comedic effect. But the basic observation is sound and hits close to home. The merest suggestion of the possibility of a resolution is heard as an accusation. Sure, Calvin’s being his normal histrionic, over-reactive self, but we’ve all had moments where we’ve heard criticism in the space between words. And a lot of the time, we’re hearing things correctly. The irony in the strip, as in pretty much all the ones in this post, is that Calvin’s reaction shows just how much he is in need of improvement. Defensiveness is a surefire sign that someone has heard something as judgment or threat. 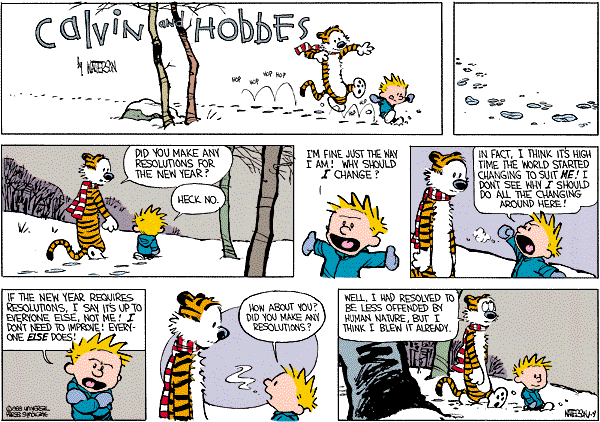 Calvin isn’t the one who needs to make resolutions, his dad does! Classic blame game scenario, done up cleverly as could be. Beyond Christ’s warning about specks and logs in eyes and whatnot, this strip gets at something fundamental about the disciplinarian. It is often right. Talk to any father and he’ll tell you stories of how he wished he’d done a better job, spent more time at home, etc. He’ll talk to you about failed resolutions. So the point here is not that the law isn’t true but that it doesn’t work, as Calvin’s tirade about the world makes clear. The disciplinarian may instruct, but it cannot inspire. Not Calvin and certainly not his Dad. 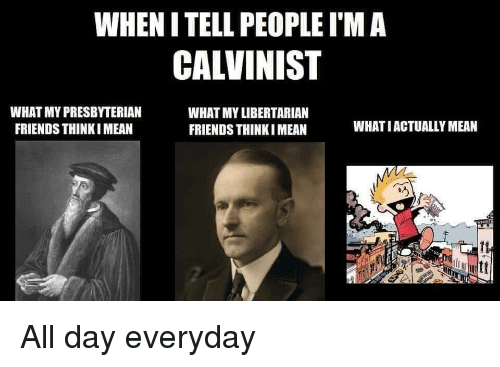 Calvin is not the problem, everyone else is. Maybe you know someone who views themselves fundamentally as a victim? Self-pity is their default reaction in pretty much every situation? (My wife certainly does…) The accusation of the law is so scary that we hide behind justifications that take the form of victimization. Hobbes’ punchline hits home brilliantly, once again taking the lid off the whole enterprise. Amazing! Not only is he hinting at an anthropology of the you-must-be-born-again variety (i.e. our problems run much deeper than our habits), he is teaching us something about the nature of the whole Law/Resolutions enterprise. We can’t handle the accusation, so instead of admitting defeat (which would entail a loss of control), we attempt to “lower the bar”. We scale it down to something more manageable that we can accomplish, momentarily assuaging that nagging voice. Jesus of Nazareth, on the other hand, raised the bar of the Law so high in the Sermon on the Mount, equating motivation with action and calling for, well, moral perfection (Matthew 5:48), that admission of defeat, or surrender, was/is the only sane option. 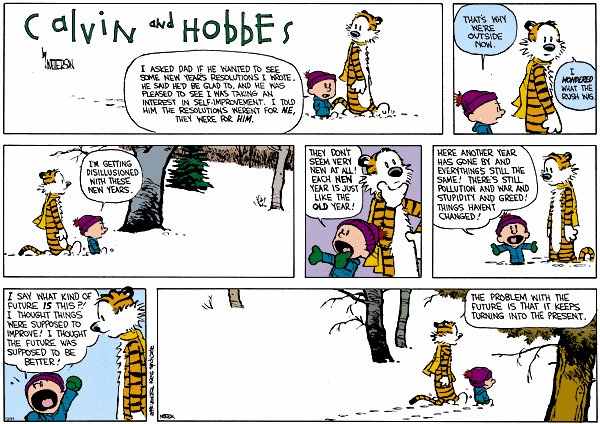 This rather pessimistic view of human nature is set in relief to Watterson’s own tremendous ability and achievement. In other words, even when he’s saying something rather bleak, he does so with so much style and wit and empathy that one can’t help but feel a bit of pride in the human race for being able to produce something so magical. There’s an amazing passage in George Eliot’s novella “Janet’s Repentance” where the title character talks about wanting something other than her resolutions to rely on, indicating that the path behind her was strewn with broken resolutions–the last thing she wanted was a new one. Calvin’s take is equally sobering, if a bit more lighthearted. Instead of trying to change things for the better, which has seemed to fail in the past, he’d be content for things simply not to get any worse. Heavy duty, but if you can’t relate to his lines about life getting more complicated the older you get, I’m not sure there’s anything that could convince you otherwise. Fear is not always an illogical response to study of history (or oneself). When I first read this strip, I wondered how Watterson had been able to sit in on my English class that year. He was depicting a strategy for justifying wrongdoing or writing off culpability that has been particularly popular in the last 20 or so years: simply to deconstruct the moral framework that is accusing you. “Relativism” is the name that used to get pinned on this kind of evasion, but it’s not a term one hears very often anymore (I’m not sure it was ever terribly accurate). Post-Modernism is another term that could apply but again, that’s just as elastic. Perhaps nihilism fits better. Yet talk to the victims of the “vice”–the child of the ugly divorce, the spouse of the abusive alcoholic, etc–and you will rarely hear a story about arbitrary moral categories. Watterson doesn’t need more than a single (brilliant) line from Hobbes to clear away the nonsense. If it was Bill Watterson’s, um, resolution to systematically dismantle the human propensity for narcissism (and the anxiety, anger and despair it produces), then I’d say he accomplished it. He gave us a gift with these annual strips: the ability to laugh at the way we tie ourselves in knots trying to better ourselves. Tullian Tchividjian has a wonderful line about the Christian life. In light of God’s forgiveness of sinners–intricately linked to the claim that Christ has fulfilled the Law on our behalf (i.e., met the resolutions we couldn’t, faced the blame, silenced the accusation, suffered the fears, etc)–“the key question of life becomes: What are you going to do now that you don’t have to do anything? What will your life look like lived under the banner which reads, “It is finished?” This is the liberating truth of the Gospel at its most gut level. Life in the shadow of the cross is not some endless trajectory of mandatory improvement. It is not a mission or a project. It is simply life. A life lived with a modicum of self-acceptance in which we act in silly and sometimes self-defeating ways, but where we are free to laugh at ourselves (and cry with others), knowing that we have been given something a whole lot more sturdy to rely on for comfort and value than our own resolutions. What’s more, we are not alone. If fact, this life with God is more like a surprise party than anything else. “Do all such good works as thou has prepared for us to walk in” as The Book of Common Prayer puts it. It is fresh and hopeful and exciting and outwardly focused–the very opposite of defeatist! And with that, I hereby call a moratorium on posts about New Years resolutions! This is great stuff, both the comics and the commentary, a great New Year’s read. My love and appreciation for Calvin and Hobbes grow ever deeper as the years pass. Thanks, DZ! This…this is amazing. My younger brother and I (ages 21 and 24) grew up reading Calvin, and it’s the only comic strip from my lifetime that I can point to and say “this is art.” No other strip spoke so strongly or intelligently, and while a critique of deconstructionism will fly over the head of a seven year old, the satire and intelligence of Watterson’s creation hits home in a way that great philosophical writings can’t. If I had a choice of going to any fictional world, I’d pick Narnia in a heartbeat and not look back. But if I got a second choice as well, Calvin’s woods would be a very strong contender for the pick. Didn’t expect that to be so emotional.